The Ag-specific cellular recall response to herpes virus infections is characterized by a swift recruitment of virus-specific memory T cells. Rapid activation is achieved through formation of the immunological synapse and supramolecular clustering of signal molecules at the site of contact. During the formation of the immunological synapse, epitope-loaded MHC molecules are transferred via trogocytosis from APCs to T cells, enabling the latter to function as Ag-presenting T cells (T-APCs). The contribution of viral epitope expressing T-APCs in the regulation of the herpes virus-specific CD8+ T cell memory response remains unclear. Comparison of CD4+ T-APCs with professional APCs such as Ag-presenting CD40L-activated B cells (CD40B-APCs) demonstrated reduced levels of costimulatory ligands. Despite the observed differences, CD4+ T-APCs are as potent as CD40B-APCs in stimulating herpes virus-specific CD8+ T cells resulting in a greater than 35-fold expansion of CD8+ T cells specific for dominant and subdominant viral epitopes. Virus-specific CD8+ T cells generated by CD4+ T-APCs or CD40B-APCs showed both comparable effector function such as specific lysis of targets and cytokine production and also did not differ in their phenotype after expansion. These results indicate that viral epitope presentation by Ag-specific CD4+ T cells may contribute to the rapid recruitment of virus-specific memory CD8+ T cells during a viral recall response. Human CD8+ T cells are important effectors of the adaptive immune system and are essential for protection against infection by many viruses (1). In response to infection Ag-specific CD8+ T cells undergo extensive proliferation to form a large pool of cytolytic effector cells to eliminate the pathogen (2). Following this peak of expansion and associated clearance of virus, memory CD8+ T cells are formed and provide the host with a pool of virus-specific CD8+ T cells capable of mounting a faster, stronger, and more effective response to secondary pathogen challenge than naive cells. Increased precursor numbers, reduced stimulatory requirements by clustering of signal adaptor molecules in lipid rafts, as well as the rapid induction of effector functions by memory CD8+ T cells contribute to enhanced recall responses (3, 4). T cell recognition of cognate MHC-peptide complexes displayed by an APC results in the formation of an area of close membrane contact between the two cells, known as immunological synapse (IS)3 (5). Once the IS has formed, the T cell stops migrating (6), polarizes its cytoskeleton toward the APC (7, 8), and initiates the movement of the TCR and CD3 to the T cell-APC interface (8, 9). One important feature of the IS is the unidirectional transfer of MHC-peptide complexes (10, 11, 12, 13) along with other molecules, such as CD80 (14), from the APC to the T cell, a phenomenon that has been described as trogocytosis (15). The expression of APC-derived molecules on T cells is biologically significant and has the potential to allow T cells to act as APCs (reviewed by Wetzel and Parker) (16). The Ag specificity of the transfer has been shown to be critical in controlling an immune response, as T cells presenting Ag to each other can induce anergy in vivo (17) or CTL-mediated killing of the presenting T cell (fratricide) (11, 12) in vitro. The capture of specific MHC-peptide complexes from an APC has also been shown in vivo to drive the affinity maturation of a secondary T cell response, by limiting the access of lower affinity T cells to Ag (18). In addition, the transfer of MHC-peptide complexes from APCs to CD4+ T cells has been proposed in the mouse system to stimulate CD8+ CTL responses (19, 20). In contrast to the stimulatory effect observed by mouse Ag-presenting CD4+ T cells (T-APCs), earlier studies have described the specific inhibition or vetoing of Ag-specific CTL responses by CD8+ T cells bearing self-Ag (21, 22, 23, 24). In this study, we examined the functional consequences of viral epitope presentation by recently activated human CD4+ T cells to the memory herpes virus-specific CD8+ T cells. To address this question, we have used human CD4+ T-APCs by genetically modifying human CD4+ T cells to express model viral Ags. These CD4+ T-APCs were used to stimulate autologous PBMCs from CMV- or EBV-seropositive healthy donors. Our results suggest that Ag presentation by CD4+ T cells during a viral recall infection results in enhanced stimulation of the CD8+ T cell response. Peripheral blood samples were obtained from CMV- and EBV-seropositive donors after obtaining informed consent. PBMCs were isolated from peripheral blood by centrifugation on Ficoll density gradient (Amersham Biosciences). The retroviral packaging cell line Phoenix-gibbon ape leukemia virus (GALV) previously described (25) was maintained in DMEM (Invitrogen Life Technologies) supplemented with 10% heat-inactivated FCS (Biochrom). EBV-transformed B lymphoblastoid cell lines (LCLs) positive for HLA-A2 were provided by Dr. S. Stevanovic (Institute for Cell Biology, Tuebingen, Germany) and maintained in RPMI 1640 medium (Invitrogen Life Technologies) supplemented with 10% FCS. When indicated, LCLs were retrovirally transduced with the pLZNGFR-PGK/pp65 construct using nerve growth factor receptor (NGFR) and phosphoglycerate kinase-1 (PGK) promoter by “spin infection” as reported previously (26). In brief, 1 × 106 cells/2 ml of viral supernatant were transferred into each well of a 6-well tissue culture plate (Costar). Following centrifugation at 32°C for 1 h, the cells were incubated at 37°C in 5% CO2 for additional 24 h. The infected LCLs cells were then washed and resuspended in fresh RPMI 1640 supplemented with 10% FCS. Transduced LCLs were analyzed for NGFR expression 7 days postinfection by FACS and were immunoselected on the same day with NGFR beads (Miltenyi Biotec). CMV pp65-specific CD4+ and CD8+ T cell lines were generated as previously described (27) using the IFN-γ secretion assay (Miltenyi Biotec). The full-length CMV pp65-coding sequence was amplified by RT-PCR from CMV-infected (strain AD169) fibroblasts, cloned into pcDNA3.1 vector (Invitrogen Life Technologies) and sequenced. LMP-2a cDNA was provided by Miltenyi Biotec. The CMV pp65 gene was modified with the human invariant chain (Ii) sorting signal to direct CMV pp65 Ag into the lysosomal compartment and facilitate presentation in the context of MHC class II. The pcDNA3 vector containing an Ii DNA fragment encoding the first 80 aa was provided by Dr. S. Stevanovic (Institute for Cell Biology, Tuebingen, Germany) The Ii-pp65 fusion gene was constructed by 20 cycles of strand overlap extension PCR with the high fidelity Pwo DNA polymerase. The pp65, Ii-pp65, or LMP-2a cDNA fragments were cloned into the retroviral vector pLZNGFR-PGK from Dr. S. Riddell (Fred Hutchinson Cancer Research Center, Seattle, WA) under the control of the internal PGK promoter. Upstream of the mouse PGK promoter the human truncated low affinity NGFR is expressed by the 5′ long-terminal repeat. The retroviral vector construct pLZNGFR-PGK/pp65, pLZNGFR-PGK/Ii-pp65, or pLZNGFR-PGK/LMP-2a was transfected into the Phoenix-GALV cell line using a calcium phosphate method (28), and supernatant was harvested from puromycin-resistant cells. CD40L-activated B cells (CD40-B) were generated as previously described (26). In brief, PBMCs (8 × 106 cells/well) were cultured on gamma-irradiated (96 Gy) human CD40L-transfected NIH 3T3 cells (t-CD40L) in the presence of IL-4 (4 ng/ml; R&D Systems) and cyclosporin A (CsA; 0.7 μg/ml; Sigma-Aldrich) in 4 ml of IMDM (Invitrogen Life Technologies) supplemented with 10% pooled human serum. The expanding cells were transferred onto freshly prepared t-CD40L cells and fed with cytokine-replenished medium with CsA every 3–4 days. Retroviral transduction was conducted as previously described (26). In brief, CD40-B cells 2 days after the second stimulation with t-CD40L were centrifuged and resuspended in 1 ml of retroviral supernatant in the presence of 8 μg/ml polybrene (Sigma-Aldrich). Retroviral infection was facilitated by spin infection as reported previously (26). In brief, each cell suspension was transferred into each well of a 6-well tissue culture plate (Costar) and the circumference of the plate was sealed with tape. Following centrifugation at 32°C for 1 h, 4 ng of IL-4 was added and the cells were incubated at 37°C in 5% CO2 for an additional 4 h. The infected CD40-B cells were then resuspended and transferred onto freshly prepared t-CD40L cells and cultured as described. Transduced CD40-B cells were analyzed for NGFR expression on day 12 of culture by FACS and were immunoselected on the same day with NGFR beads (Miltenyi Biotec), to obtain an enriched population of transduced cells. These transduced and immunoselected donor Ag-presenting CD40-B (CD40B-APCs) were expanded in the culture conditions described for 14 days after initial activation and used in stimulation cultures. Human CD4+ T cells were isolated from PBMCs by negative selection using MACS human CD4+ T cell isolation kit (Miltenyi Biotec) as instructed by the manufacturer. CD4+ T cells were then stimulated with anti-CD3 mAb (30 ng/ml) and irradiated feeder cells as previously described (28) in RPMI 1640 supplemented with 10% human pooled serum and 50 U/ml recombinant human IL-2 (Prolusion; Chiron). On day 2, cells were washed and resuspended in retroviral supernatant supplemented with 50 U/ml recombinant human IL-2 and 8 μg/ml polybrene (Sigma-Aldrich) spun at 1,000 × g for 1 h at 32°C and incubated for 24 h. CD4+ T cells were then washed and cultured in fresh medium containing 50 U/ml recombinant human IL-2. Retrovirally transduced cells were analyzed for NGFR expression on day 12 of their culture by FACS and were then immunoselected by anti-NGFR microbeads to obtain an enriched population of transduced cells. Transduced and NGFR immunoselected donor CD4+ T cells (CD4+ T-APC/pp65, CD4+ T-APC/LMP-2, or CD4+ T-APC/mock) were expanded in the culture conditions described for 14 days after initial activation and used in stimulation cultures. Where indicated, CMV pp65 CD4+ T cells were cocultured with autologous CD40B-Ii-pp65 cells at a 1:1 ratio at 37°C for 4 h. At the end of the incubation, the CD4+ T cells were purified out of the cell mixture using CD4 microbeads and these cells were used as CD4+ T-APCs (transient Ag expression). HLA-A*0201+ or HLA-B*0702+ CD40B-APCs or CD4+ T-APCs were gamma-irradiated (30 Gy) and added to autologous PBMCs at a APC: responder ratio of 1:10 in T cell medium consisting of RPMI 1640 supplemented with 10% heat-inactivated human pool serum. Where indicated, CD3+ T cells were used as responders in the stimulation cultures. One day after stimulation, human IL-2 (recombinant human IL-2; Chiron) was introduced into the cultures at a final concentration of 5 U/ml and every 2 days thereafter. If necessary rapidly growing cells were split into two wells and fed with fresh medium containing 5 U/ml IL-2. On day 7, T cell populations were harvested and assayed. For phenotypic characterization of CD40B-APCs and CD4+ T-APCs at day 14 of their culture, cells were stained with mouse mAbs CD70, CD80, CD86, and CD137L all PE-labeled (all from BD Pharmingen). Tetrameric analyses were performed with HLA-A*0201 tetramers complexed with the peptide NLVPMVATV (CMVpp65/495–503) or HLA-B*0702 tetramers complexed with the peptide TPRVTGGGAM (CMVpp65/417–426), both derived from CMV pp65, or with HLA-A*0201 tetramers complexed with the peptide CLGGLLTMV (EBVLMP2a/LMP2a426–434), derived from EBV LMP2a protein, all PE-labeled (ProImmune), together with a FITC-labeled anti-CD8 and a PerCP-labeled anti-CD3 Ab (BD Pharmingen). For immunophenotyping of CTLs, FITC-labeled, and PerCP-labeled Abs used against the molecules were CD8, CD45RO, CD27, CD62 ligand (CD62L), and the chemokine receptor CCR7 (all from BD Pharmingen). Isotype-specific negative controls were included in all experiments. Cell samples were analyzed in a FACSCalibur (BD Biosciences), and at least 30,000 events in the gate were collected for each sample and analyzed with the CellQuest Pro software. Intracellular cytokine (ICC) staining was performed as recently described (27) with the following modifications. Untransduced or transduced CD40B-APCs and CD4+ T-APCs were mixed with autologous PBMCs or a CMV CD8+ T cell line at a 5:1 or 1:1 ratio, respectively. For cytokine profiling after 7 days of coculture, CTLs were incubated with either untransduced or pp65-transduced LCLs (LCL/pp65) at a 1:1 ratio. In all cases, cells were incubated in the presence of the costimulatory mAbs CD28 and CD49d (2 μg/ml each; both BD Biosciences) for 6 h. Brefeldin A (10 μg/ml; Sigma-Aldrich), was added for the last 5 h of the incubation. Positive controls were performed by stimulating the cells with 0.5 μg/ml PMA and 1 μg/ml ionomycin (both Sigma-Aldrich). Samples were permeabilized (BD Perm; BD Biosciences) and stained with FITC-labeled anti-CD8, PE-labeled anti-IFN-γ (BD Biosciences) and analyzed with a FACSCalibur (BD Biosciences) and analyzed as described. To test the functional consequences of acquisition, CMV pp65-specific CD8+ or CD4+ T cells were incubated with 10 μM CFSE (Molecular Probes) for 10 min at 37°C in serum-free medium, and then washed extensively to remove unbound CFSE. CFSE-labeled CMV pp65-specific CD8+ or CD4+ T cells were cocultured with LCL/pp65 or CD40B/Ii-pp65 cells, respectively, at a 1:1 ratio at 37°C for 4 h. At the end of the 4-h incubation, dead cells were removed from the cell mixture by centrifugation on Ficoll density gradient. CD8+ or CD4+ T cells in the cell mixture were purified by positive selection using CD8 or CD4 microbeads (Miltenyi Biotec). The capacity of CD8+ or CD4+ T cells that acquired surface molecules to stimulate production of IFN-γ was then assessed by ICC. CFSE-labeled CD8+ or CD4+ T cells were incubated with autologous unlabeled CMV-specific CD8+ or CD4+ T cells (CD8+ T cell line >90% tetramer-positive) at a 2:1 ratio for 5 h in the presence of brefeldin A. Samples were permeabilized (BD Perm; BD Biosciences) and stained PE-labeled anti-IFN-γ (BD Biosciences) and analyzed in the FACSCalibur. LCL and LCL/pp65 were labeled with 51Cr for 1 h at 37°C. The expanded CD8+ T cell lines (CTLs) were washed and added at various ratios to 5 × 103 per well labeled target cells in U-bottom 96-well plates and incubated for 4 h at 37°C. Then supernatants were counted in a Micro-beta Counter (PerkinElmer). The percentage of specific lysis was determined using the following formula: [(experimental release − spontaneous release)/(maximum release − spontaneous release)] × 100. To establish a surrogate system for Ag presentation of viral epitopes, we have introduced the whole sequence of viral Ags by retroviral transduction into human activated CD4+ T cells. The transduction efficiency was assessed by the proportion of viable cells expressing NGFR 10 days postinfection by FACS analysis. The percentage of positively stained cells with anti-NGFR mAb was 45% (range 30–60%; data not shown). The same day, retrovirally transduced cells were positively selected for NGFR expression (Fig. 1⇓) to obtain a pure population of viral Ag-expressing cells and used as APCs (CD4+ T-APCs). The same method of Ag loading was also used for professional Ag-presenting CD40-B (CD40B-APCs) and served as our positive control for Ag presentation throughout this study. Homogenous Ag expression in retrovirally transduced CD40B-APCs and CD4+ T-APCs. Activated CD40-B and CD4+ T cells were transduced with the viral supernatant from Phoenix-GALV transfected with pLZNGFR-PGK/pp65. On day 12 of their simulation cycle, cells were analyzed for NGFR expression and immunoselected the same day. 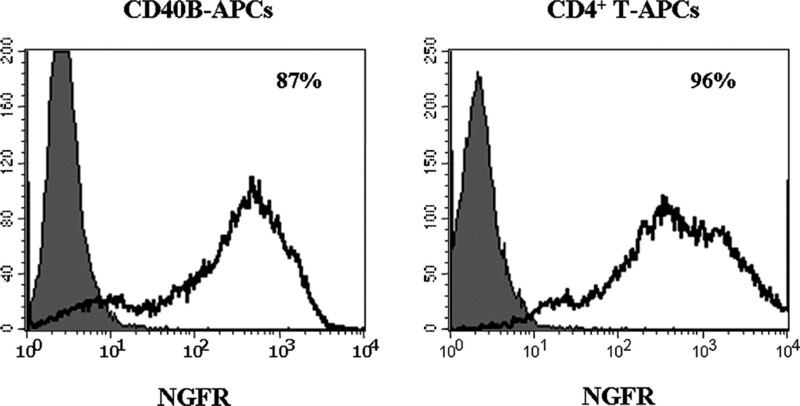 Fluorescence distribution of pp65 transduced CD40B-APCs and CD4+ T-APCs (open histogram) and NGFR-negative fraction as a negative control (filled histogram) are represented. The percentage of NGFR-positive cells is indicated. Because sufficient expression of costimulatory molecules closely correlates with APC function, the expression level of costimulatory ligands was determined on both CD40B-APCs and CD4+ T-APCs by FACS analysis. CD40B-APCs expressed higher levels of all tested costimulatory ligands than CD4+ T-APCs (Fig. 2⇓). To assess whether the observed differences in costimulatory ligand expression between CD4+ T-APCs and CD40B-APCs have an influence on the degree of activation of Ag-specific CD8+ T cells, fresh autologous PBMCs from CMV-seropositive donors were incubated with both kinds of APCs expressing the CMV pp65 protein. After 6 h of stimulation, the percentage of Ag-specific CD8+ T cells producing IFN-γ was very similar (12.0 vs 11.2%) when using CD40B-APCs or CD4+ T-APCs (Fig. 3⇓), demonstrating that even if CD4+ T-APCs express lower levels of costimulatory ligands, they are equally potent in inducing Ag-specific production of cytokines as professional APCs. Human activated CD4+ T cells express costimulatory molecules. Isotype-matched negative control staining (filled histogram) and specific mAb staining to CD40B-APCs and CD4+ T-APCs genetically modified with the CMVpp65 (open histogram) are represented. CD40B-APCs and CD4+ T-APCs were stained and analyzed on day 14 of a 2-wk in vitro CD40L and OKT-3 stimulation cycle, respectively. Comparative FACS analysis is representative of four independent experiments with different donors. CD4+ T-APCs are as efficient as professional APCs in inducing specific cytokine production in freshly isolated PBMCs. CD40B-APCs and CD4+ T-APCs/pp65 were used to stimulate autologous CD8+ T cells from a CMV-seropositive donor for 6 h at a responder:stimulator ratio of 5:1 and IFN-γ production was measured by ICC staining. The percentage of cells positive for both CD8 and IFN-γ is indicated. The data presented indicate that Ag presentation by CD4+ T cells can activate memory CD8+ T cells to produce cytokines. Yet, the extent of Ag-driven expansion may vary between different APCs. Therefore, PBMCs from HLA-A2- and/or HLA-B7-positive CMV- or EBV-seropositive donors were cocultured with either autologous irradiated CD4+ T-APCs or CD40B-APCs/pp65 in the presence of 5 U/ml IL-2. The expansion of tetramer-specific CD8+ T cells was evaluated by FACS at the end of a 7 day in vitro stimulation cycle. As shown in Fig. 4⇓A, CD40B-APCs and CD4+ T-APCs stimulated a robust Ag-induced expansion of CD8+ T cells. Propagation of herpes virus-specific CD8+ T cells using CD4+ T-APCs. Peptide specificity of the expanded CD8+ memory T cells was assessed by MHC tetramer staining. A, CMVpp65- and EBVLMP2a-specific CD8+ T cells were generated from an HLA-A*0201 CMV- or EBV-seropositive donor with pre-existing CD8+ T cells against the NLV and CLG epitope, respectively. Stimulator cells were either autologous gamma-irradiated CD40B-APCs or CD4+ T-APCs. B, Activated CD4+ T cells without the Ag (CD4+ T cells parental) and activated CD4+ T cells retrovirally transduced with an empty vector (CD4+ T-APCs/mock) were used as controls. A 10:1 responder:stimulator ratio was used. Cells were stained for CD8, CD3, and NLV or CLG tetramers after one in vitro stimulation (7 days) and analyzed by flow cytometry. Percentage of tetramer-positive T cells after gating on the CD3+CD8+ T cells is indicated in each plot. C, CD4+ T-APCs act directly on the CD8+ T cells to induce their proliferation. CD3+ selected T cells were used as responders in stimulation cultures with autologous gamma-irradiated CD4+ T-APCs at a responder:stimulator ratio of 10:1 in the presence of IL-2 (5 U/ml). Seven days poststimulation cells were stained with CD8 FITC, tetramer PE, and CD3 PerCP and analyzed by flow cytometry. D, PBMC responders were stimulated with either CD40B-APCs or CD4+ T-APCs at different responder:stimulator ratios. Each point represents the absolute number of CD8+ NLV+ T cells. Starting from <1% tetramer-positive cells at the onset of the cultures, after 7 days of coculture with CD40B-APCs and CD4+ T-APCs/pp65, 27.4% and 28.7% of the CD3+CD8+ T cells stained positive with the HLA-A*0201/pp65495–503 tetramer, respectively (Fig. 4⇑A, top). Similar expansion patterns for CD8+ T cells were also observed with the HLA-B*0702/pp65407–416 (data not shown). We next investigated whether, in addition to CMV pp65, the CD4+ T-APCs were capable of inducing expansion of CD8+ T cells against other viral Ags with low precursor frequency. As shown in Fig. 4⇑A, bottom, CD4+ T-APCs/LMP-2a mediated substantial expansion (from 0.1% up to 3%) of CD8+ T cells specific for the HLA-A2-restricted subdominant LMP-2 epitope derived from EBV. PBMC responder cells cultured under identical conditions in the presence of activated CD4+ T cells not bearing the Ag (CD4+ T cells parental) or CD4+ T cells retrovirally transduced with an empty vector (CD4+ T-APCs/mock) did not result in expansion of pp65 and LMP2a tetramer-positive CD8+ T cells, respectively (Fig. 4⇑B). To exclude the possibility that the CD8+ T cell proliferation observed by CD4+ T-APC stimulation is due to Ag uptake by PBMC-derived APCs, we analyzed the proliferation of CD8+ T cells after purification of CD3+ cells and used them as responders in the stimulation cultures. We found that the action of CD4+ T APCs is direct on the CD8+ T cells as the expansion of Ag-specific CD8+ T cells observed when CD3+ T cells were used as responders was equivalent to that with whole PBMC responders (Fig. 4⇑C). We next examined the CD4+ T cell APC potency. APC titration experiments revealed similar potency of CD4+ T-APCs and professional APCs (CD40BB-APCs) in stimulating the expansion of memory Ag-specific CD8+ T cells (Fig. 4⇑D). Taken together, these data not only demonstrate that the immunostimulatory effect of CD4+ T-APCs is Ag-specific, but also that CD4+ T-APCs are as potent as professional APCs in inducing CD8+ T cell responses. Stimulation of T cells with APCs, in the absence or low levels of costimulatory ligands, can result in anergy of the stimulated T cells. To assess the functional status of the CD4+ T-APC-induced CD8+ T cells, we determined their Ag-specific cytolytic activity by a 51Cr release assay on day 7 of their ex vivo expansion (Fig. 5⇓A). The CD4+ T APC expanded CD8+ T cells lysed HLA-A2-positive pp65-transduced LCLs in a dose-dependent manner. Low background killing was observed by parental nontransduced LCLs, indicating that the killing activity of these CTLs is CMV pp65-specific. Effector function of the generated CD8+ T cells was further evaluated by analyzing the cytokine production of the expanded CMV-specific CD8+ T cells upon activation with APCs. 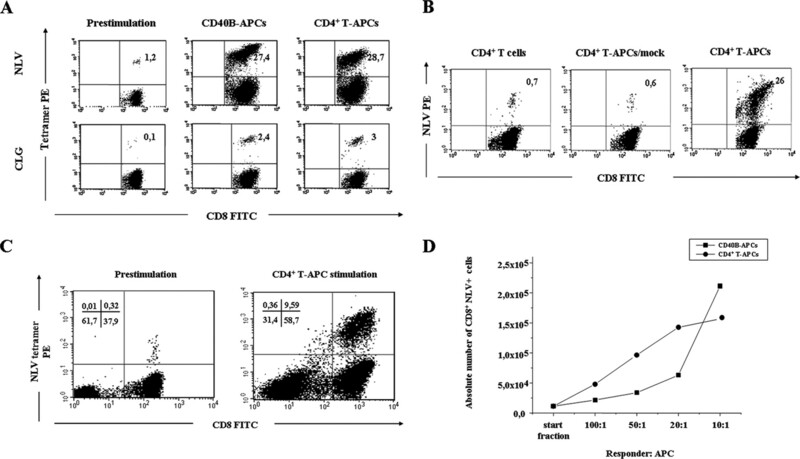 An intracellular IFN-γ assay was performed, using as responders the expanded CD8+ T cells, derived after a 7-day in vitro stimulation with either CD4+ T-APCs or CD40B-APCs, against parental or pp65-transduced LCLs. The CD4+ T-APCs-induced CD8+ T cells were as efficient as CD40B-APCs-induced CTL in their capacity to produce IFN-γ when restimulated with Ag (Fig. 5⇓B). This finding indicates that the CD4+ T-APCs-induced CD8+ T cells can produce effector cytokines upon Ag rechallenge. 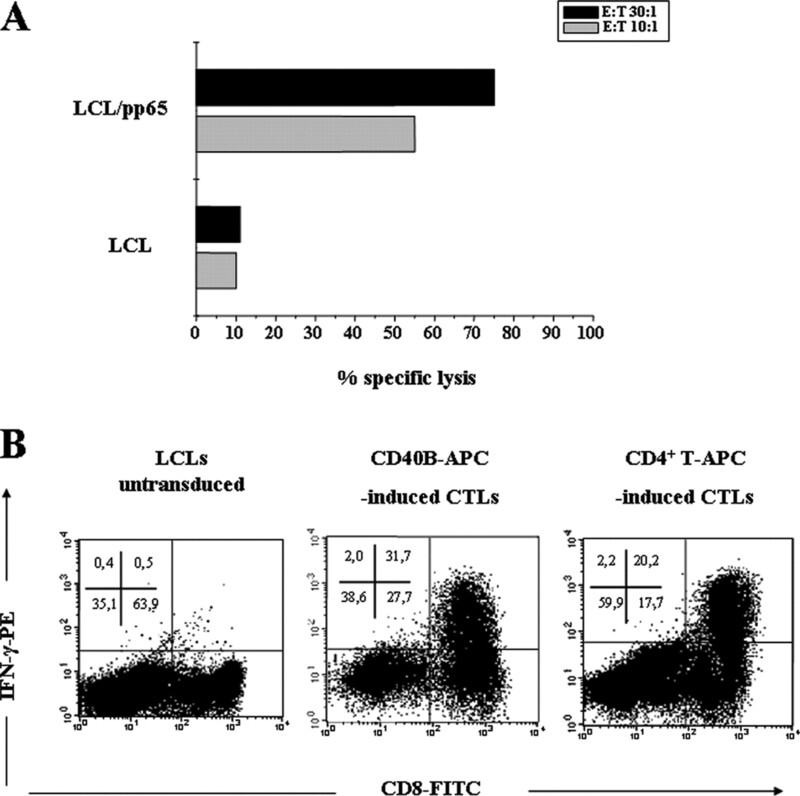 CD4+ T-APC-induced CTLs recognize and lyse endogenous CMVpp65 Ag on target cells. A, The CMVpp65-specific CD8+ memory T cells expanded by one in vitro stimulation (7 days) with autologous CD4+ T-APCs/pp65 were tested for CMVpp65-specific lysis of LCL/pp65 using a 51Cr release assay. Cytolytic activity of the expanded cells is shown as a percentage of specific lysis. Target cells used were either HLA-A2-positive LCLs or HLA-A2-positive LCL transduced with the CMVpp65 (LCL/pp65). B, ICC staining of CMVpp65-specific CD8+ T cells stimulated with either HLA-A2-positive LCLs (left) or HLA-A2-positive LCLs transduced with CMVpp65 gene (right) after a 7-day coculture with autologous CD4+ T-APCs/pp65. Similar results obtained from three different donors. Stimulation of Ag-specific T cells with different APCs may result in the generation of a different T cell population with either effector/memory or central/memory phenotype, based on the expression of costimulatory and homing receptors such as CD45RA or CD45RO, CD27, CD62L, and CCR7. Therefore, the expression profile of Ag-specific CD8+ T cells was evaluated 7 days after the initial stimulation and compared with the phenotype of CD8+ T cells before initiation of T cell cultures. After gating on the CD8+ tetramer-positive T cells, we observed that CD45RO was highly expressed on both CD40B-APC- and CD4+ T-APC-induced cultures. All specific CTLs were CD45RA−, CCR7−, and CD62L− consistent with an effector/memory phenotype, sensitized with either CD4+ T-APCs or CD40B-APCs (Fig. 6⇓). Taken together, these data demonstrate that CD4+ T-APCs can present endogenous Ag to memory CD8+ T cells and induce robust expansion, in which the resulting CTLs resemble both functionally and phenotypically typical effector/memory CTLs. CD4+ T-APC-induced CTLs are of an effector/memory phenotype. 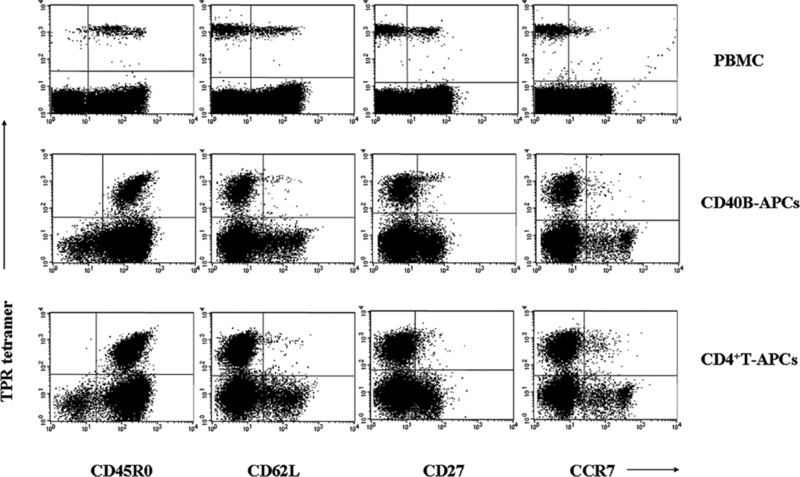 CD8+ T cells were characterized by staining for (left to right) CD45RO, CD62L, CD27, and CCR7 (x-axis) against the HLA-B*0702/pp65407–416 (PE-labeled, y-axis). As indicated, CD8+ T cells from peripheral blood before stimulation (PBMC) or after one in vitro expansion for 7 days using autologous gamma-irradiated CD40B-APCs or CD4+ T-APCs. During the formation of the IS, MHC-peptide complexes travel from the APCs to T cells allowing the latter to act as APCs (T-APCs). To address whether Ag-specific T cells upon activation can function as APCs for responder CD8+ T cells, we examined the capacity of activated Ag-specific CD8+ T cells to acquire antigenic peptides, while interacting with other CD8+ T cells with the same specificity. For these experiments, CMVpp65-specific CD8+ T cells were labeled with CFSE (referred to as CD8+ T-APCs) and cultured for 4 h with LCL targets expressing the CMV pp65 Ag in form of retroviral vector (LCLs/pp65). At the end of the incubation period with targets, the CD8+ T-APCs were purified from the cell mixture using CD8 magnetic beads. These cells were subsequently cultured together with autologous CMVpp65-specific CD8+ T cells. After 6 h, IFN-γ production was determined by ICC staining in the CFSE-negative fraction. As shown in Fig. 7⇓A, CFSE-negative CMVpp65-specific CD8+ T cells produced IFN-γ upon recognition of the acquired Ag displayed by the CFSE-positive fraction. By contrast, the same cells did not produce IFN-γ in response to the CFSE-labeled cells that were incubated with LCLs expressing the mock retroviral vector (Fig. 7⇓A, left). Transfer of antigenic material by trogocytosis during T cell: T cell interactions leads to stimulation of a CD8+ T cell response. A, CFSE-labeled HLA-A2+ CMVpp65-specific CD8+ T cells were incubated with HLA-A2+ LCLs/pp65 or LCLs/mock targets. At the end of 4 h incubation, dead cells were removed and CD8+ T cells were selected using CD8 microbeads. CFSE-labeled CD8+ T cells were then cultured for 6 h with autologous CD8+ T cells. IFN-γ produced by the CFSE-negative CD8+ T cells was evaluated by FACS. B, CFSE-labeled CMVpp65-specific CD4+ T cells were incubated with autologous CD40B/Ii-pp65 or CD40B/mock targets. At the end of a 4-h incubation, dead cells were removed and CD4+ T cells were selected using CD4 microbeads. CFSE-labeled CD4+ T cells were then cultured for 6 h with autologous CD8+ T cells. IFN-γ produced by the CFSE-negative CD8+ T cells was evaluated by FACS. 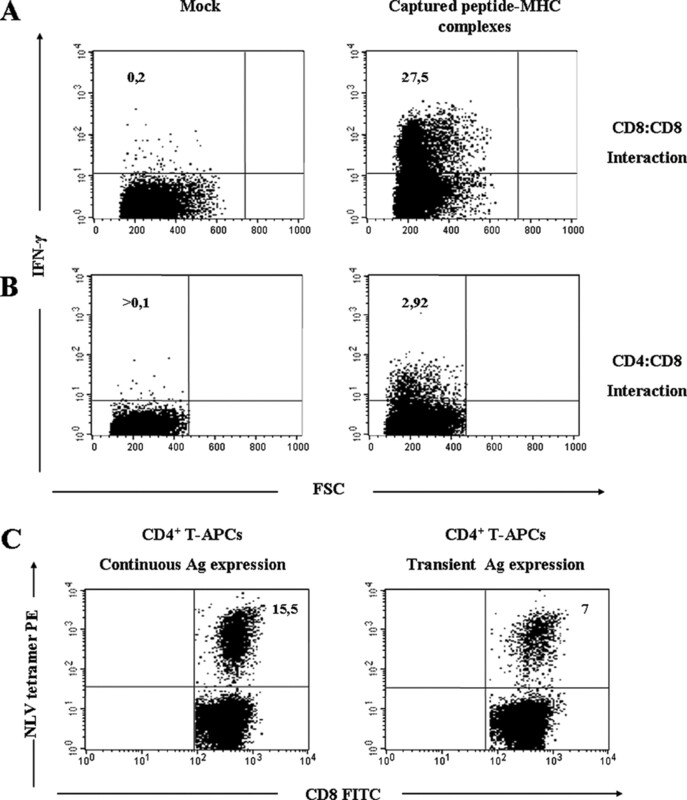 C, Comparison between continuous and transient Ag presentation by CD4+ T-APCs. Activated CD4+ T cells retrovirally transduced with the CMV pp65 Ag (continuous Ag expression) and CD4+ T cells that have captured Ag after coculture with CD40B-Iipp65 target cells (transient Ag expression) were used as CD4+ T-APCs in stimulation cultures with fresh PBMC responder cells at a 10:1 responder:stimulator ratio. Tetramer specificity of the expanded CD8+ T cells was assessed by FACS 7 days poststimulation. As Ag-specific CD4+ T cells first encounter professional APCs in the lymph node, we investigated whether epitope-loaded MHC class II were acquired by CMVpp65-specific CD4+ T cells during contact with professional APCs, resulting in subsequent stimulation of Ag-specific CD8+ T cells. For this purpose, CMV pp65 Ag presentation was directed into the MHC class II pathway by attaching the Ii sequence to CMV pp65 gene at the 5′ end and autologous CD40B cells were genetically modified with the Ii-pp65 construct (CD40B/Iipp65). CMVpp65-specific CD4+ T cells were labeled with CFSE cocultured with CD40B/Iipp65 and then selected using CD4 magnetic beads. As shown in Fig. 7⇑B, also recently activated CMVpp65-specific CD4+ T cells can activate CMVpp65-specific CD8+ T cells as a result of Ag transfer. We next sought to address whether Ag trogocytosed by CD4+ T cells would enable them to stimulate the expansion of memory CD8+ T cells. A direct comparison of Ag-specific CD8+ T cell expansion using either continuous (retrovirally transduced) or transient (after trogocytosis) Ag presentation by CD4+ T-APCs is shown in Fig. 7⇑C. The analysis revealed that activated CD4+ T cells that have trogocytosed Ag are also able to elicit a specific CD8+ T cell response, although to a lesser extent that CD4+ T cells, which are stably transduced with the Ag. Thus, acquisition of antigenic material by Ag-specific CD4+ cells during contact with APCs, licenses T cells to act themselves as APCs and stimulate an Ag-specific CD8+ T cell response. In this study we have investigated the functional consequences of viral epitope presentation by human activated CD4+ T cells genetically modified to express viral Ags on the stimulation of memory Ag-specific CD8+ T cells. Using two model viral Ags, CMV pp65 and the EBV LMP2a, we show that CD4+ T cells can present Ag to memory CD8+ T cells and induce activation and robust expansion, after which the resulting CTLs resemble both functional and phenotypical effector/memory cells. There is considerable evidence in support of the notion that both activated αβ T cells (16, 29) and activated γδ T cells (30) can function as APCs (so-called T-APCs) and thereby affect the activities of other T cells. Several studies have indicated that TCR ligation plays a central role in the generation of the T-APC phenotype. Biosynthesis of MHC and costimulatory molecules or acquisition of intact MHC complexes from APCs represent two Ag-dependent mechanisms that couple TCR recognition with T cell expression of MHC molecules loaded with specific peptides. Both pathways enable T cells to use cognate receptor specificity, guiding the specificity of Ag presentation. However, their role in the immune response remains a matter of debate because of the wide variety of cell types and experimental settings used, though sometimes generating conflicting results (17, 31, 32, 33, 34, 35). Ag presentation by T cells to activated Ag-specific T cells typically results in down-regulatory signals by inducing either apoptosis (21, 22, 23, 24, 31, 32) or clonal anergy (17, 31) and desensitization of responders in vitro (34). By contrast, other studies have documented that when the responding T cells are freshly isolated, then the T-APCs can induce IL-2 production and proliferation among naive responder T cells (33, 35). We show in this study that human CD4+ T cells genetically modified to express viral Ags can function as APCs to stimulate herpes virus-specific CTL responses. The efficiency of the direct Ag presentation was evidenced by the numerical expansion and proliferation of CMV pp65 and LMP2a tetramer-positive CD8+ T cells in response to irradiated CMV pp65+ and LMP2a+ CD4+ T-APCs, respectively, in vitro. Consistent with our finding that CD4+ T-APCs express multiple costimulatory ligands (although to a lesser degree than professional APCs) is the fact that CD4+ T-APC-elicited CMV pp65 and LMP2a CD8+ responders are functional with respect to cytokine production and cytolytic killing. Interestingly, comparative studies revealed the same potency when using professional APCs, namely CD40-B cells, identically Ag-loaded. The immunosuppressive effects of Ag presentation by T cells described in other studies may be related to high expression of CTLA-4 on the T cell lines and clones that were used as APCs, (36) or may relate to differences in bidirectional signaling between cell lines of the same specificity and freshly isolated cells. By contrast, unidirectional presentation has been shown to lead to a significant proliferative response (31). Moreover, depending on the state of activation of the reactive T cell line, stimulation with T-APCs may induce anergy or proliferation (37). In this study, we demonstrate that in contrast to activated T cell lines and clones, freshly activated CD4+ T cells can stimulate the expansion of autologous memory CD8+ T cells. Furthermore, by using class I tetramers to identify and enumerate the Ag-specific CTLs, we were able to exclude a veto cell inactivation of Ag-specific antiviral CD8+ T cells in our system. In contrast to earlier studies using CD8+ T cells as APCs (22, 23, 24), we found that CD4+ T-APCs have no veto activity. These results are in agreement with studies that have shown that Ag-specific secondary CTL responses are resistant to veto cell suppression in vitro (21). The stimulation of the CD8+ T cell response achieved in this study, in contrast to peptide-pulsed T cells previously used as T-APCs, may be related to the duration of Ag presentation. We have designed an alternative and more physiological system for Ag delivery to CD4+ T cells than peptide pulsing. Retroviral transduction of CD4+ T-APCs with viral Ags provides a stable and continuous intrinsic MHC class I-peptide complex supply, thus enabling longer lasting Ag presentation to CD8+ T cells than peptide-pulsed T-APCs. We reason that the induction of immunogenic or tolerogenic activity by CD4+ T-APCs reflects differences in the efficiency of Ag presentation. In addition to endogenous expression of MHC and costimulatory molecules by T cells, several reports have described the unidirectional cell surface transfer of these molecules from APCs to both CD4+ and CD8+ T cells through the IS (10, 11, 12, 15, 17). This phenomenon, which has been called trogocytosis, is attracting increasing attention due to its potential physiological relevance. Studies in the mouse system have demonstrated that CD8+ T cells acquire MHC class I-peptide complexes from APC, and when these cells present Ag to other CTLs of the same specificity, fratricidal effects are produced, resulting in the down-regulation of CTL responses (11, 13). Fratricide killing has been proposed to account for the state of T cell exhaustion that results after exposure to high doses of Ag (11). Similarly, Tsang and coworkers (17) reported that previously activated mouse CD4+ T cells acquired MHC class II molecules and presented Ag to themselves, resulting in an increase in apoptosis and in the induction of hyporesponsiveness. Our results show a completely different picture when human activated CMVpp65-specific CD8+ or CD4+ T cells acquired antigenic peptides from LCL/pp65 and CD40B/Ii-pp65, respectively, after coculture. We have shown that both CD8+ and CD4+ T cells can present the acquired material to responder CD8+ T cells in vitro. The acquired molecules on both CD4+ and CD8+ T cells were functional, leading to the activation of the responder CMVpp65 CD8+ T cells as determined by IFN-γ production in a 6-h assay. It has been suggested that the fratricidal effect observed in previous studies may not be physiological because it only occurs when an extremely high concentration of MHC class I-restricted antigenic peptide is added externally to the target cell. The most obvious explanation for the immunostimulatory effect observed in our study is the lower and more physiological concentration of the endogenously processed peptides, presented by APCs, as it would occur during natural infection. In support of this notion, Hudrisier et al. (38) have shown that distinct thresholds for CTL function correlate with differences in the amount of Ag trogocytosed, and fratricide could only be detected at very high Ag concentrations. Two recent mouse studies have re-examined the physiological relevance of APC molecule acquisition by CD4+ T cells. Kennedy et al. (19) demonstrated the ability of Th cells to act as APCs to present MHC class I-restricted epitopes to naive cells to generate central memory CTLs. In addition, Xiang et al. (20) demonstrated that T cells have the capacity to recruit other T cells and act as helper cells for the generation of effector CTLs. The authors (20) suggest that the presence of antigenic material on these Th cells might provide a simple way of imparting some specificity on help delivery, which might be particularly significant when there is need to expand T cell clones specific for a relatively rare Ag. In agreement with these two reports, we extend the findings to the human system and demonstrate that activated CD4+ T cells capture antigenic material from professional APCs through the IS to enable themselves to act as APCs for the effective stimulation and expansion of memory CD8+ T cell responses in vitro. We therefore hypothesize that during infection CD4+ T cells in contact with activated professional APCs in the lymph node can acquire Ags and present them to neighboring virus-specific CD8+ T cells. Ag presentation by CD4+ T cells might be a mechanism to amplify the effector/memory CD8+ T cell response for faster control of a viral rechallenge. 1 This work was supported by Grant LSHB-CT-2004-503319 from Allostem and SFB-479/TP-C12 from Deutsche Forschungsgemeinschaft. 3 Abbreviations used in this paper: IS, immunological synapse; ICC, intracellular cytokine; NGFR, nerve growth factor receptor; CD62L, CD62 ligand; T-APC, Ag-presenting T cell; CD40-B, CD40L-activated B cell; CD40B-APC, Ag-presenting CD40-B cell; CsA, cyclosporin A; GALV, gibbon ape leukemia virus; LCL, lymphoblastoid cell line; PGK, phosphoglycerate kinase; Ii, invariant chain; t-CD40L, CD40L-transfected NIH 3T3 cell. van Lier, R. A., I. J. ten Berge, L. E. Gamadia. 2003. Human CD8+ T-cell differentiation in response to viruses. Nat. Rev. Immunol. 3: 931-939. Wherry, E. J., R. Ahmed. 2004. Memory CD8 T-cell differentiation during viral infection. J. Virol. 78: 5535-5545. Dustin, M. L., S. K. Bromley, Z. Kan, D. A. Peterson, E. R. Unanue. 1997. Antigen receptor engagement delivers a stop signal to migrating T lymphocytes. Proc. Natl. Acad. Sci. USA 94: 3909-3913.
van der Merwe, P., S. J. Davis, A. S. Shaw, M. L. Dustin. 2000. Cytoskeletal polarization and redistribution of cell-surface molecules during T cell antigen recognition. Semin. Immunol. 12: 5-21. Dustin, M. L., J. A. Cooper. 2000. The immunological synapse and the actin cytoskeleton: molecular hardware for T cell signaling. Nat. Immunol. 1: 23-29. Krummel, M. F., M. M. Davis. 2002. Dynamics of the immunological synapse: finding, establishing and solidifying a connection. Curr. Opin. Immunol. 14: 66-74. Game, D. S., N. J. Rogers, R. I. Lechler. 2005. Acquisition of HLA-DR and costimulatory molecules by T cells from allogeneic antigen presenting cells. Am. J. Transplant. 5: 1614-1625. Hudrisier, D., J. Riond, H. Mazarguil, J. E. Gairin, E. Joly. 2001. Cutting edge: CTLs rapidly capture membrane fragments from target cells in a TCR signaling-dependent manner. J. Immunol. 166: 3645-3649. Wetzel, S. A., D. C. Parker. 2006. MHC transfer from APC to T cells following antigen recognition. Crit. Rev. Immunol. 26: 1-21. Tsang, J. Y. S., J. G. Chai, R. Lechler. 2003. Antigen presentation by mouse CD4+ T cells involving acquired MHC class II:peptide complexes: another mechanism to limit clonal expansion. Blood 101: 2704-2710. Kennedy, R., A. H. Undale, W. C. Kieper, M. S. Block, L. R. Pease, E. Celis. 2005. Direct cross-priming by Th lymphocytes generates memory cytotoxic T cell responses. J. Immunol. 174: 3967-3977. Xiang, J., H. Huang, Y. Liu. 2005. A new dynamic model of CD8+ T effector cell responses via CD4+ T helper-antigen-presenting cells. J. Immunol. 174: 7497-7505. Fink, P. J., H. G. Rammensee, M. J. Bevan. 1984. Cloned cytolytic T cells can suppress primary cytotoxic responses directed against them. J. Immunol. 133: 1775-1781. Rammensee, H. G., Z. A. Nagy, J. Klein. 1982. Suppression of cell-mediated lymphocytotoxicity against minor histocompatibility antigens mediated by Lyt-1+Lyt-2+ T cells of stimulator-strain origin. Eur. J. Immunol. 12: 930-934. Rammensee, H. G., A. Juretic, Z. A. Nagy, J. Klein. 1984. Class I restricted interaction between suppressor and cytolytic cells in the response to minor histocompatibility antigens. J. Immunol. 132: 668-672. Rammensee, H. G., D. Hugin. 1989. Masking of veto function in vivo by activated CD4+ T lymphocytes. Eur. J. Immunol. 19: 643-648. Horn, P. A., M. S. Topp, J. C. Morris, S. R. Riddell, H. P. Kiem. 2002. Highly efficient gene transfer into baboon marrow repopulating cells using GALV-pseudotype oncoretroviral vectors produced by human packaging cells. Blood 100: 3960-3967. Kondo, E., M. S. Topp, H.-P. Kiem, Y. Obata, Y. Morishima, K. Kuzushima, M. Tanimoto, M. Harada, T. Takahashi, Y. Akatsuka. 2002. Efficient generation of antigen-specific cytotoxic T cells using retrovirally transduced CD40-activated B cells. J. Immunol. 169: 2164-2171. Rauser, G., H. Einsele, C. Sinzger, D. Wernet, G. Kuntz, M. Assenmacher, J. D. M. Campbell, M. S. Topp. 2004. Rapid generation of combined CMV-specific CD4+ and CD8+ T-cell lines for adoptive transfer into recipients of allogeneic stem cell transplants. Blood 103: 3565-3572. Topp, M. S., S. R. Riddell, Y. Akatsuka, M. C. Jensen, J. N. Blattman, P. D. Greenberg. 2003. Restoration of CD28 expression in CD28−CD28+ memory effector T cells reconstitutes antigen-induced IL-2 production. J. Exp. Med. 198: 947-955. Holling, T. M., E. Schooten, P. J. van Den Elsen. 2004. Function and regulation of MHC class II molecules in T-lymphocytes: of mice and men. Hum. Immunol. 65: 282-290. Brandes, M., K. Willimann, B. Moser. 2005. Professional antigen-presentation function by human γδ T cells. Science 309: 264-268. Chai, J. G., I. Bartok, D. Scott, J. Dyson, R. Lechler. 1998. T:T antigen presentation by activated murine CD8+ T cells induces anergy and apoptosis. J. Immunol. 160: 3655-3665. Lombardi, G., R. Hargreaves, S. Sidhu, N. Imami, L. Lightstone, S. Fuller-Espie, M. Ritter, P. Robinson, A. Tarnok, R. Lechler. 1996. Antigen presentation by T cells inhibits IL-2 production and induces IL-4 release due to altered cognate signals. J. Immunol. 156: 2769-2775. Jago, C. B., J. Yates, N. O. Camara, R. I. Lechler, G. Lombardi. 2004. Differential expression of CTLA-4 among T cell subsets. Clin. Exp. Immunol. 136: 463-471. Wyss-Coray, T., C. Brander, K. Frutig, W. J. Pichler. 1992. Discrimination of human CD4 T cell clones based on their reactivity with antigen-presenting T cells. Eur. J. Immunol. 22: 2295-2302. Hudrisier, D., J. Riond, L. Garidou, C. Duthoit, E. Joly. 2005. T cell activation correlates with an increased proportion of antigen among the materials acquired from target cells. Eur. J. Immunol. 35: 2284-2294.